From Telltale Games comes the App Minecraft Story Mode for Android, iPhone and iPad. The game Minecraft is supposed to be almost a household name, while it was already bought a million times. 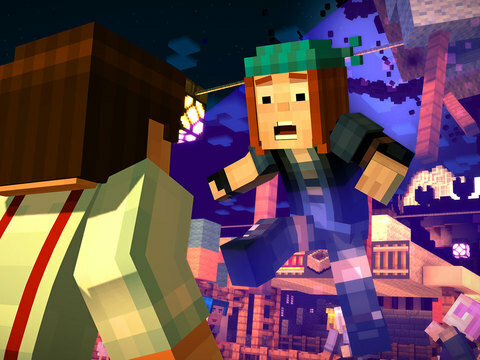 Minecraft Story Mode is a comprehensive five episodes Adventures in the Minecraft universe. According to a graphical environment, the characters and Co look familiar, but the gameplay is totally different. This was made possible with the fact that Telltale Games has the game in cooperation with Mojang the creators of Minecraft developed. But for whom it is worth buying the nearly 5 USD app for Android and iOS? This question should be answered in our Minecraft Story Mode review. As described in our introduction, Minecraft Story Mode is an adventure game with an extensive storyline. Accordingly, you are bound here the adventure and can not act freely. Accordingly, it is also clear that the focus of this game is the story. It is impressive how Telltale has the little blocks characters breathed to life. The movement, depending on the expression situation lips, eyes, eyebrows and Co. In addition, the figures were completely set to music. It should be noted that Minecraft Story mode comes only with English audio output. However, it may also act with different subtitles. What disappointed us a little is the fact that despite the high price for the App (Android / iOS) only the first episode is unlocked. For the four other episodes you have to fork out 14.99 USD then again. However, considering the price is quite to understand, since Telltale Games has a very extensive game released with extensive storyline. Accordingly, you can spend a few hours per episode. But who should buy Minecraft Story Mode from the iTunes App Store / Google Play Store? From our perspective, it is worth buying just for adventure fans, who are on an extensive story. Furthermore, you have to like the Minecraft pixel block optics, because Minecraft Story Mode plays in this universe. With 4.99 USD Minecraft Story Mode for Android, iPhone and iPad is not exactly a bargain when you consider that most apps are offered much cheaper. The real hammer is, however, that you can only play the first episode. Who wants to play the remaining four episodes, has to resort to 14.99 USD expensive in-app purchase. Therefore, our warning is that you should be aware of this if you want to buy Minecraft Story Mode for Android, iPhone or iPad. The price is justified because Minecraft Story Mode offers you hours of fun. The extensive story about the adventure is making the app highly recommended. You can buy Minecraft Story Mode currently for 5.30 Euro (in Germany) in the Google Play Store. Note that you only receive the first episode. For the players, the app comes with 4.5 stars and is consistently good, although there are still problems in some smartphones / tablets. What is needed is Android 2.3.3 or higher. Be the first to comment on "Minecraft Story Mode: Warning – Only the first episode is in the app – App Review"